Thoughts from upside down: Audrey Hepburn and the Eiffel Tower - twice! Audrey Hepburn and the Eiffel Tower - twice! There are two movies that feature both Audrey Hepburn and the Eiffel Tower (well, I suppose there could be more). One is well known and you will find it by googling those two subjects - Funny Face, one of her hallmark movies. It's a great movie, which we saw at the Stanford Theater last night. (One of the really nice things about living near Palo Alto is this movie theater, lovingly and expensively restored and specializing in classic movies, mostly pre-1960). By coincidence, we had watched the other one the previous night at home. Any guesses? It's the Lavender Hill Mob, one of the greatest of the British Ealing comedies, from 1951. The main characters are Alec Guiness and Stanley Holloway, with other classic stars from the time like Sid James and Sidney Tafler. The Eiffel Tower has a central role in the plot, including a fantastic scene where the two heroes run down the emergency staircase. 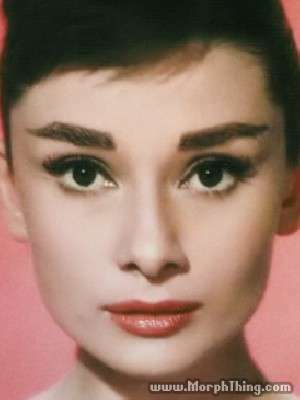 And Audrey Hepburn? In 1951 she was still an unknown. She has a tiny walk-on part at the beginning. You wouldn't recognize her unless you were looking. It was only when the closing credits rolled by that I saw her name. Going back to Funny Face, there are some wonderful period-piece scenes. For avaiation fans, the scene of the TWA Constellation taking off is enough to make the whole film worthwhile. Then they land at Orly, where on short final they fly over Notre Dame and the Champs Elysees. Funny, this never happens when I go to Orly. 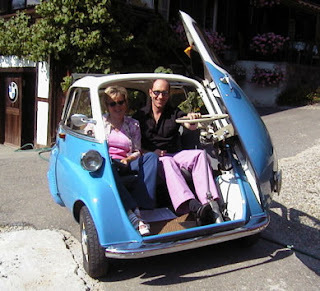 Another great detail is the Isetta, a 1950s "bubble car". It's a weird little thing, with a single door which is also the front of the car. For the movie they gave it a funny pweep-pweep horn, which the real thing didn't have.